1. The Unfolding Drama Of The End Times^2. Are We Running Out Of Time?^3. Miscalculating The Second Coming^4. Jesus Never Set A Date For His Return^5. Beware Of False Prophets^6. Only God Can Prophesy!^7. Can We Still Believe In The Rapture?^8. What About Those Who Are Left Behind^9. What Will Happen When Christ Returns?^10. Will There Be A Literal Kingdom On Earth?^11. The Final Reality: The New Earth^12. What Can We Do In The Meantime?^13. The Outcome Is Certain! - Publisher Some People say that the last days are upon us right now. Others say the end times are in the distant future. Who is right? Is it possible to know? If you're wondering what you can know for certain about the timetable of last days' events, you'll find answers to your most pressing questions right here: -Can I still believe in the soon return of Christ even after A.D 2000? -Why have so many people miscalculated the Second Coming? -How do the events unfolding today relate to biblilical prophecies? -How can Christ's return be imminent if there are still unfulfilled prophecies? This balanced look at the unfolding of Bible prophecy in a wildly chaotic world will help you sort fact from fiction. Learn how to avoid excessive speculation and receive hope, inspiration, and a veral clear picture of what God has revealed for sure about the last days. - Publisher Dr. Ed Hindson is the assistant pastor at Atlanta's Rehoboth Baptist Church and also serves as the dean of the Institute of Biblical Studies at Liberty University in Virginia. Hindson holds a D.Min. degree from Westminster Seminary and a D.Phil. from the University of South Africa. Some People say that the last days are upon us right now. 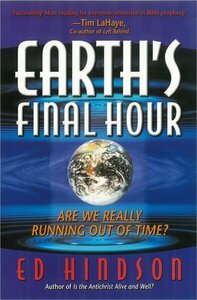 Others say the end times are in the distant future. Who is right? Is it possible to know? If you're wondering what you can know for certain about the timetable of last days' events, you'll find answers to your most pressing questions right here: -Can I still believe in the soon return of Christ even after A.D 2000? -Why have so many people miscalculated the Second Coming? -How do the events unfolding today relate to biblilical prophecies? -How can Christ's return be imminent if there are still unfulfilled prophecies? This balanced look at the unfolding of Bible prophecy in a wildly chaotic world will help you sort fact from fiction. Learn how to avoid excessive speculation and receive hope, inspiration, and a veral clear picture of what God has revealed for sure about the last days. Dr. Ed Hindson is the assistant pastor at Atlanta's Rehoboth Baptist Church and also serves as the dean of the Institute of Biblical Studies at Liberty University in Virginia. Hindson holds a D.Min. degree from Westminster Seminary and a D.Phil. from the University of South Africa.